Writing high emotions is tricky. Too much high drama and blatant telling and the emotion is lost in a superficial blur. But if the emotions are high and also deep and written with restraint the reader can feel the intensity as if it were his own. Try this writers! Imagine or remember an intense experience and write it so that your reader believes you. I think it’s great practice for creating characters who demand empathy from the reader. For me this requires many revisions. The right phrasing or word can be so elusive. But I find that if I just put myself back into the emotion and quietly breath it in over and over, the words will come. When I hold my infant grandson, Teddy, the son of my much-loved son, next to my heart, his new little body nestled into mine, I close my eyes and an unbelievable tide of love for him flows through me, calm and peaceful. He chirps and I’m delighted. It’s almost like holding his father, when my son was an infant, all over again. Memories of those same, first bolts of love surge up once more. And now, just a few weeks later and 24 hours ago, Layla and Sadie, my daughter’s twin bundles are here too. It’s hard to breath with so much happiness in my soul. I put together a bunch of pink balloons, three dark pink and three light pink since my daughter wants her twins to be individuals, with lots of flowing ribbons and tiny white flowers. “I’m sorry, you can’t bring those up to the room. They’re latex and not allowed in maternity.” The receptionist behind the front desk at the hospital was apologetic. I looked at her. She couldn’t mean it. My daughter just gave birth to twins! I have to bring them up. No. My disappointment magnified inside me out of all proportion. But I want her to have them! I thought. “Wait here,” her colleague said. She returned and gave me two non-latex balloons from the gift shop that said ‘It’s a girl.’ Sometimes I am overwhelmed by the kindness of strangers. These balloons were not my lovely pink creation but they were filled with warmth and understanding from one woman to another. What can I say about holding my little granddaughters two hours old? I can’t quite tell them apart yet. I just look at them and they blur into beauty, daughters of my much-loved and beautiful daughter. I snuggle them next to my heart, one at a time, and the profound love I feel is so deep and so magical that I close my eyes and feel sure that I am in heaven. My own baby daughter again times two. Now I must figure out a way to hold all three little ones in my arms at once. 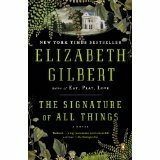 Elizabeth Gilbert in her new book, The Signature of all Things writes a scene of intense emotion for her main character, Alma. Alma learns that her secret and unsuspecting love is to marry a ninny. I felt the hurricane inside her so intensely I clutched the sides of the book, yet the author’s depiction was measured, albeit tense. Alma’s outward demeanor was a mask. What a magnificent blog entry, Cynthia. Thank you for sharing your joy and gratitude. We share it with you. Much love on the birth of THREE grandchildren in just a few weeks. Birth mirth. Probably the most moving blog Cynthia has written. The emotion was so powerful while still being understated. She was able to transmit to me her loving feelings. I could feel those babies in my arms. Thank you Cynthia. “It’s hard to breathe with so much happiness in my soul.” So perfect for such a profound feeling. I really love it! Congratulations, it gets better and better!